Is it The Best Blueberry Cheesecake? A title like that promises a lot, doesn’t it? I found this recipe online; the title pulled me in. I make really good cheesecake, but I wondered if this was better than mine. Our karate club was about to have a reason to celebrate, and I was looking for a special Banzai Treat. One of our students was testing for a big milestone rank and the treats needed to be something beyond our usual bars and cookies. Our group likes cheesecake (seriously – what don’t we like?!?) and I had a lot of blueberries in the freezer, so I went looking for a blueberry cheesecake recipe. I would have used my standard recipe, but was curious to see what I would find online. This one, from Food.com, had great reviews and the name intrigued me. The original recipe is for a regular sized cheesecake but things that are “grab and go” are easier than desserts requiring plates, utensils, etc. So instead of making one large cheesecake, I made minis! Making crust for tiny cheesecakes is a pain (and I’m impatient! ), so I dropped a cookie in the bottom of the tin to give the cheesecake filling some support. You could choose any cookie that works well with the cheesecake flavors, and I went with Golden Oreos. Why? So I could eat the rest of the cookies that weren’t used for the cheesecakes! Why else?!? 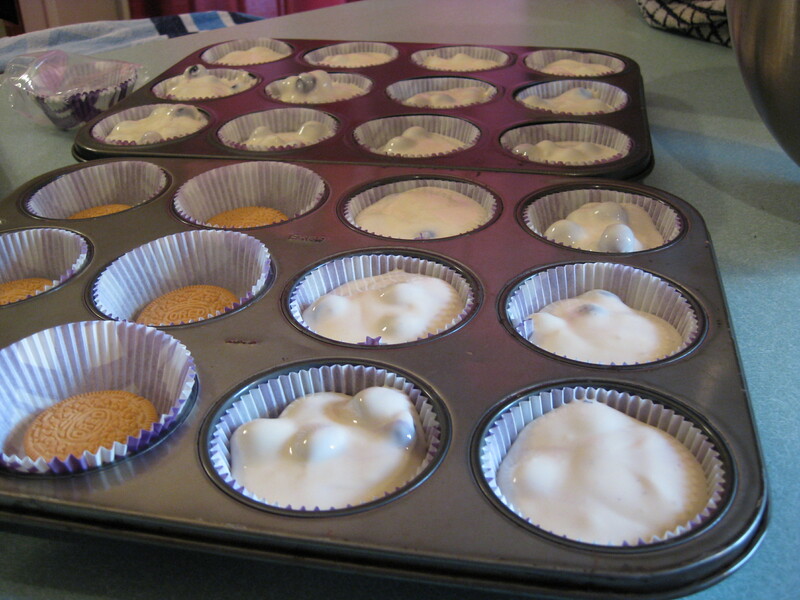 I loaded up muffin tins with muffin liners, a Golden Oreo, and the creamy filling and popped them in the oven. The recipe made 26 minis. Well, in my case it made 24 minis plus a 6 oz. ramekin which I’m calling a Quality Control mini. Other than changing the crust and leaving off the topping, I made the recipe as it was written. Click for recipe. These cheesecakes puff up in the oven and will sink and shrink while they cool, but don’t be alarmed. I didn’t add the topping suggested in the recipe, but might next time. Alternately, you could top your creation with whipped cream and fresh blueberries. Oh yeah – you probably want to know if they’re any good. Yes, they definitely are! And coming from someone who has made and eaten as much cheesecake as I have, that’s high praise. 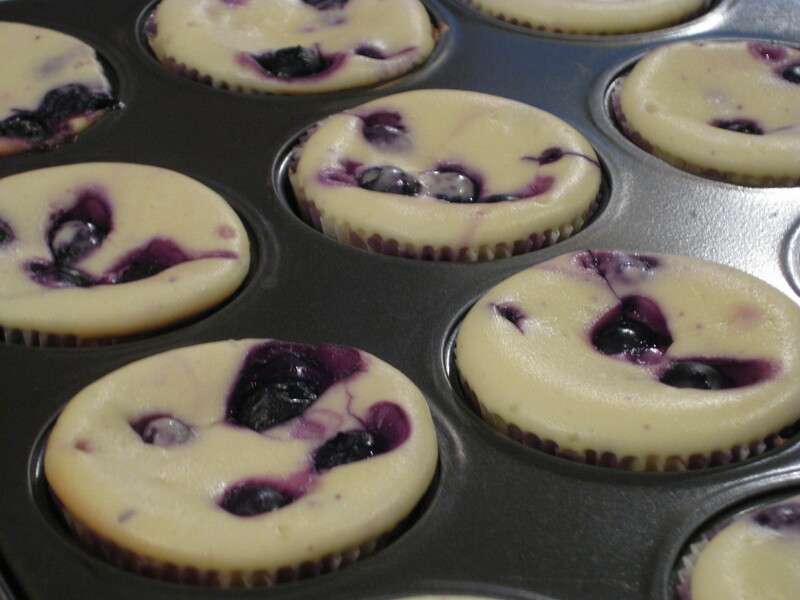 The filling is smooth and creamy, and the lemony cheesecake base highlights the blueberries nicely. I still prefer my cheesecake recipe, but I really enjoyed these and so did our Karate Club! If you’ve never made a cheesecake, don’t be scared by these – they’re hard to mess up. You’ll be surprised at how easy they are, and I think you’ll like them! These look so yummy, and seeing how a friend just gave me a bag of freshly picked blueberries I might have to try this!